In 1803 President Thomas Jefferson selected his personal secretary, Captain Meriwether Lewis, to lead a voyage up the Missouri River to the Rockies, over the mountains, down the Columbia River to the Pacific Ocean and back. Lewis and his partner, Captain William Clark, endured incredible hardships and saw incredible sights. In Undaunted Courage, Stephen Ambrose has pieced together previously unknown information to provide a colorful and realistic backdrop for the expedition which is seen through Lewis's eyes. Lewis is supported by a rich variety of colorful characters: Jefferson, whose interest in exploring and acquiring the American West went back thirty years; Clark, a rugged frontiersman whose love for Lewis matched Jefferson's; numerous Indian chiefs; the French and Spanish fur traders of St. Louis; and many leading political, scientific, and military figures of the turn of the century. High adventure, high politics, suspense, drama, and diplomacy combine with high romance and personal tragedy to make this outstanding work of scholarship as engaging as any work of fiction. If you are looking for a light overview of the Lewis & Clark adventure, THIS IS NOT IT! This is an in-depth, detailed account of Merewether Lewis starting before his birth and ending past his death. Stephen Ambrose is a biographer who leaves no stone unturned. He is an excellent writer, and every bit if this book is packed with more information than you ever thought you wanted to know. A great book, but only if you want a microscopic look at the famed adventure. Very time consuming and at times tedious, but well worth it. I learned so much that I never knew or had even heard about the Lewis & Clark Expedition. Fascinating story. The book is a long, hard slog with some interesting moments. Part of the problem was the narrator, who was so mechanical I wondered if it was computer-generated and made basic mistakes -- the most grating of which for me was that he consistently mispronounced Monticello with a soft c. The author's accuracy was similarly brought into question for me when every time he referred to John Quincy Adams post-presidency legislative career, he called him Senator John Quincy Adams. JQA was in the House, never the Senate. These are both such basic things to get wrong and undercut my ability to trust what I could not personally verify from other sources. The book is only worthwhile in that it has a wonderful adventure story to tell. Lots of other books have told the story better. I enjoyed the book. I learned a lot and, was amazed at the intricacy of the analysis of all aspects of the expedition. The reader was monotonous and boring. An extremely boring litany of dates and events. The book was Boring and the narrator was awful. This version was too abridged -- felt like I missed a lot. The narration was okay, but could/should have been more animated. The Lewis & Clark expedition is an import part of US history, the characters true adventurers & the situations they found themselves in dangerous/exciting/tragic -- this didn't quite make the mark. I wasn't sure if I would be able to finish this selection when the narrator first started reading he was very mechanical. I am glad I stuck with it, he finds his comfort zone. The journey back and final days of Luis were more complete than other books that I have read on this subject. When I selected this I thought it would be a fun interesting real life story of lewis and clark. It is real but it is not fun or interesting. The reader was soooo sllloooww and dull, it was putting me to sleep. I knew I would not be able to survive so I sent it back without even finishing one cd. As I listen to this excellent audiobook, I feel the pride and commitment of the participants as if I were there myself. This is an easy-to-follow assessment of one of our truly great American adventures. Oh, and the narrator speaks good english, too. None of that heavy British accent to muddle through. This book is long, but well worth the listen. With a subject such as Lewis and Clark, it’s easy for popular beliefs to shape the story. However, once you read this book, Ambrose sets you straight with a historically accurate version of the journey. Plus, Ambrose puts everything in context of the political climate at the time, which is very, very insightful. 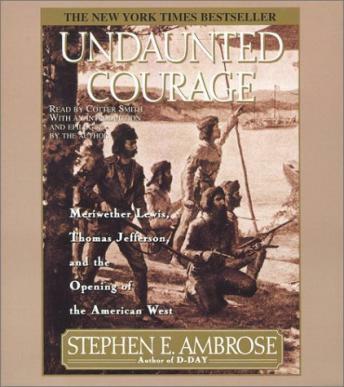 Ambrose also does a superb job of painting a biographical portrait of Captain Meriwether Lewis from birth to death. Personally, I enjoyed hearing “the rest of the story” about everything that happened to Lewis and Clark after they returned from their trip.